Compiled by the internationally acclaimed Canadian composer Kyle Bobby Dunn, “Drunk Fall” features songs by close friends such as Thomas Meluch (Benoît Pioulard), Kyle’s brother Danny (“Black Bones”), and influences both old (Fleetwood Mac, Jeff Alexander) and new (Grouper, Tim Hecker). The mix culminates in an excerpt of the stunning unreleased Kyle Bobby Dunn track “Duckfaced Fantasy.” Over the last decade Kyle Bobby Dunn has been amassing an impressive body of work and his distinctive minimalist music has been released on such independent labels as Desire Path Recordings and UK-based independent label Low Point. Kyle Bobby Dunn’s double album “Bring Me the Head of Kyle Bobby Dunn” (Low Point) and “In Miserum Stercus” (a 12″ on Komino) were both released last year. This Autumn Low Point will reissue “Fragments & Compositions of Kyle Bobby Dunn” on 12″ vinyl. 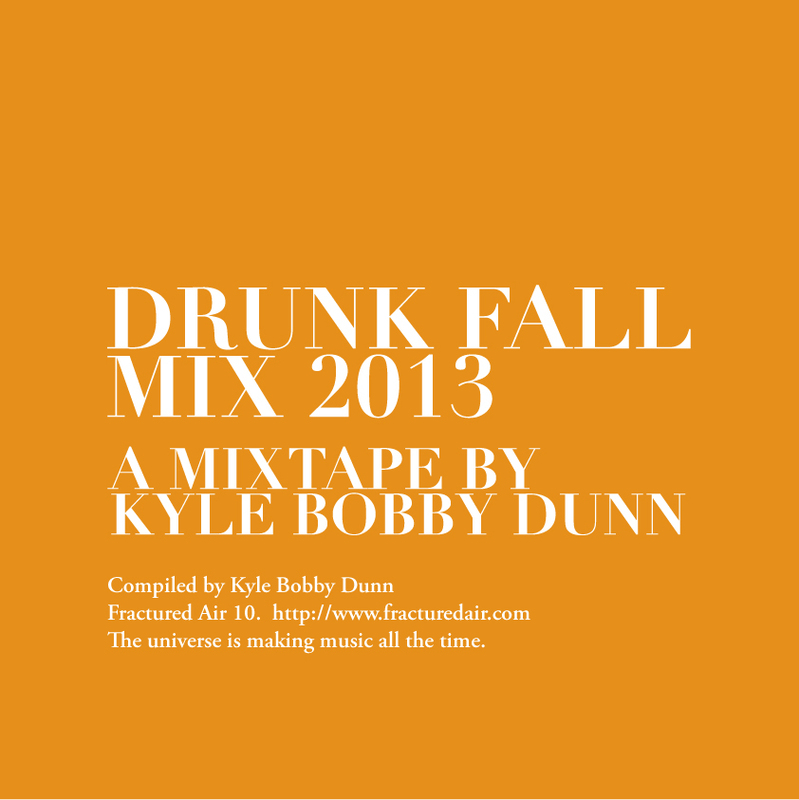 Fractured Air Drunk Fall Mix 2013 by Kyle Bobby Dunn. So I got very drunk on a bad bottle of wine like any old night in my life and compiled a series of autumn songs that are by some beautiful people in the world and some that I am utterly in love with until death do me part. From my best buddy’s Second Remasters digital album that came out at a perfect time last year and features his beautiful girlfriends reverb’d out backing vocals. This song is super powerful to me and I think is one of the most underrated best songs ever written. Listen to the sheer power, look up at a raining sky and let that laughter become tears or vice versa. Absolute beauty does exist. I don’t care what anyone says. Seeing it and experiencing at least once in life is such a gift and I cherish it. This song is written by some guy I don’t know but recorded and performed by the most beautiful woman I’ve ever met and who has the most perfect voice in the world. Perfect everything actually, no wonder my imperfections are no match for her. Tom’s music gets better with every new lovely album he releases but this song from his first album, Précis, gets me every time and I’m reminded of the intense impact of my life the year it was released and the years that have followed since. I started to listen to Fleetwood Mac a while ago and I know it’s silly of me but this such a great track. There is a kind of unspoken intensity hiding in all their elements and this song has become a favorite recently. I got to play in a beautiful space with this beautiful woman over the summer and her music has haunted me and lulled me for years. When I first heard this song in February earlier this year it matched how high and low my spirits were and how those two are basically the same anyway I seem to shake it. Long live Liz and long live love. Eamon Quinn and I met at this utterly perfect concert showcase last fall and I immediately fell in love. Now we are good buds and play funny songs and work together at a funny job all day. This tune goes on longer as well but it shows Eamon’s awesome guitar dynamics and he doesn’t need to plug into a computer to do it. Dude is rad. I remember traveling down a dark highway with this one a few years ago, well many years now, and needing to pull over in the pitch black because the tears would not stop and I was sure to drive permanently into the dark if I didn’t stop. Maybe that was what Kozelek was going for in this gorgeous song because I still cry every time. A sad soundtrack number from Francis Lai for when you’re alone and you know it. I listen to this soundtrack over and over again and sit alone at the bar drinking Macallan. Thought I’d drunkenly throw this in as well…. I don’t know. Some acoustic version of this Francophone pop group in Montreal. I think it means that love basically renders us immobile. Just to keep the decidedly drunken acoustic thing going but it’s the beautiful Bach prelude from his cello suites so you can’t blame me too much. My brother sent me this a while back. He and I both use loops to build our music but he really wants people dance more than I do, so maybe see if you can? Or just dance with your drink like I usually do. If you still feel like dancing, another great Barsky track for you. This is one of his best as well and shows his talent for programming and elegant song writing. To me, Josh is recording in outer space and his tracks are like him spilling whisky down on us from outer space. Thanks Josh, seriously. I really haven’t liked a Tim Hecker release as much as his first one, Haunt Me, which is still so great to listen to any old fall day as there are many autumn memories on that one. This is a new song of his and makes me want to do my drunk dance in the street or the rain but I wish nobody was around to see it because it always seems nobody is around anyway. Yes a new song. Many new ones are in the works and I actually love everything I’ve been working which is a big change, and here’s a small bit that should remind you that love is like a thought you can hold on to and I think that what we hold in our minds we love the most and I feel so lucky to be able to hold thoughts and memories, for as drunk as I get.